There have been a few questions about my thumbnail post below in the comments and by email, so I thought I'd elaborate some more here. On a few of the pages you mention that you used other movies for inspiration, like the shining. I thought that was very interesting and its an approach I haven't tried before. How do you make a scene, that is from another movie, relate to your scene, and what do you look for in those scenes? It would be very helpful to hear how you plan your scenes by using material from other movies. This is a good question. Let me start by saying that I'm not looking to steal someone else's performance for my scenes. Rather, I'm looking for ideas that I wouldn't have thought of on my own. I can only go so far on my imagination; pretty soon my characters will all start to move and behave like me! Therefore I find it important to look outside myself for inspiration and reference, be it in other films or in real life. When doing research for a character I try to find live actors who resemble the character somehow, in personality and/or physiology. In the case of Syndrome, Brad Bird had suggested several actors, including Jack Nicholson. Nicholson's performance in The Shining is over-the-top, perhaps even cartoony, so I thought I might find some interesting ideas in there. I was looking for poses, facial expressions, gestures, bits of timing, anything I could find to make Syndrome more creepy and threatening (and a jerk). For the scene where Syndrome says "I'll give them heroics; I'll give them the most spectacular heroics anyone's ever seen!" I drew inspiration and reference from The Shining, Paul Gleason in The Breakfast Club, Ratigan in The Great Mouse Detective, and of course, my own imagination. Maybe this is too in depth, but how do you decide how far to take a thumbnail? I mean, many times I have very loose thumbnails, and i wonder if it is better making them more refined. Like, even the stick figures have all of the motion etc defined and of the correct proportions for the character. The purpose of a thumbnail is just to communicate the important facts about a pose. For instance, the angle of the hips and shoulders, the curve of the spine, the placement of the feet, etc. Some rudimentary facial expressions may also be in order, depending on the shot. As long as you can clearly communicate these things to yourself (and anyone you may need to show them to) that is far enough. I think it's also important to convey the basic proportions of the character you're animating, otherwise you may draw poses that the model can't really achieve. That said, as someone who likes to draw I often find myself embellishing my thumbs with more detail than they need, just because I enjoy the process! Once you get your boards, how close must you follow them when planning and thumbnailing? It depends on the story boards. Sometimes they're very specific and indicate exactly what the director wants, so I try to match them as best I can. Other times the boards are loose and just suggest the main beats of the shot, so I try to make it my own. The director and I will discuss the scene before I begin planning, and he'll let me know what he expects and how closely I need to follow the boards. I periodically get requests from students and others to see some of my planning drawings, so I've put together a little gallery of some of my favorites from past projects. They're not meant to stand alone as good drawings, but you might find them interesting as an example of the thinking that goes into my work at Pixar and AnimationMentor.com. I've included a bunch from my one Ratatouille shot, which I linked in a previous post. There's a good article on the AP website that further explores the debate about motion-capture as animation. You can read the full article here. Below are some quotes that I found interesting. The creators of "Beowulf" don't call it animation, nor do they intend to replicate real life. "If one were to call it traditional animation, I think it would be a disservice to the brilliant animators of the like that worked on 'Roger Rabbit,' that brought those characters to life. I also think it would be a disservice to the performers like Ray Winstone, whose performance lives on-screen." I only animated one shot on Ratatouille. I was working on Cars promotional material and WALL-E during most of Rat's production, but I begged them to give me a shot on the film because I knew it was so special (and I wanted to work with Brad Bird again). I figured they'd give me a simple acting shot or some little gag, but instead they gave me a full-body shot of humans on rollerskates! It was pretty challenging, and I did most of the work on my own time. 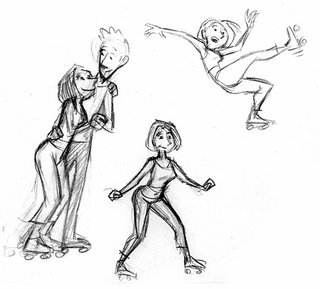 I did a lot of research and worked out some ideas with my wife (who used to skate competitively), but I ended up throwing most of that out and going from my imagination, because the shot was so short and needed to be broad. The only direction I had was that Colette is a bad skater, Linguini is a good skater, and they need to exit frame right. How this happened was pretty much up to me. I'm happy with how Colette's spin and fall worked out, but I think the weight of Linguini lifting her still needs work. Ah well, animation is never finished, only abandoned. I'm sure you're familiar with the 11 Second Club - a monthly animation competition that follows in the footsteps of the late 10 Second Club. The prize for this month's competition, sponsored by AnimationMentor.com, was a critique by a professional animator, in this case, me! Here you can get an idea of what an "eCritique" looks like for students who enroll in AM's animation courses. Every week the mentors review the students' assignments in this fashion. It's a pretty neat setup, allowing the mentors to analyze students' work frame by frame and even draw on it. Students and mentors can be anywhere in the world (that has an internet connection), and there is also a weekly Q&A conducted live via webcam. Hope you enjoy the eCritique! 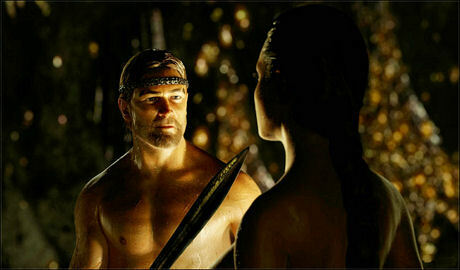 The film "Beowulf" has been approved for submission for the Best Animated Feature Oscar by the Academy. You can read more about it here. I haven't seen Beowulf, and I usually keep my negative thoughts off of this blog, but I find this a disturbing development. To my mind, submitting a motion-captured performance as "animation" is akin to submitting a heavily retouched photo as a "painting". Let me back up a bit and say that I'm not wholly opposed to motion capture (or "performance capture", as Mr. Zemekis would have me call it), just as I'm not opposed to Photoshop and digital collages; these technologies have their places. The fact that I have yet to see a compelling or life-like performance created with motion-capture is beside the point. The question becomes, "what is animation?" I'm sure that many animators worked on Beowulf to clean up the capture data, massage performances and animate non-human characters elements. But does this extra work beyond the raw capture data make it animation? Where do we draw the line between recorded action and creative animation? Between the retouched photo and the painting. The more I ask myself this, the more I realize that these are the wrong questions to ask, because the answer require a level of semantics that distracts from the more important question: "Which is the best film?" As visual effects and digital cinema become more advanced the term "Animated Feature" loses its significance, at least when judging the merits of a story, because the line between performance and visual effects is becoming blurred. I believe the category of Best Animated Feature should not exist, because it creates an arbitrary distinction between mediums and ultimately ghettoizes animation into a separate category so that it can never compete for Best Picture. If you want to make distinctions, do it by genre, not by medium. Ratatouille is the best reviewed film of the year, but it will never compete directly against the year's live-action films because the Academy has it squarely seated at the kids' table. Going to be in the San Francisco area this Thursday, November 8th? Check out the new documentary, "The Pixar Story" at the 2nd SF International Animation Festival. 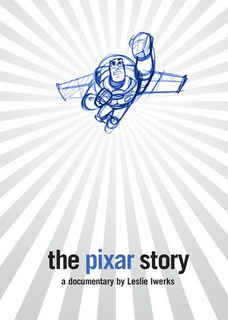 It's a great film and an intriguing look at the genesis of Pixar. Yours Truly is the first face you see in the doc! Woohoo! Director Leslie Iwerks will introduce the film and participate in a Q&A. Cars is out on Blu-Ray today, too!